Keeping your FJ Cruiser operating properly is important and a big part of this is regular oil changes. This doesn’t have to be that hard, here is how to do it. Keeping on regular maintenance items will keep your FJ driving like this! Toyota recommends you change your FJ Cruiser’s oil and oil filter every 6 months or 5,000 miles (depending on vehicle year and oil type). In order to change your oil, you will need a flat space, a way to catch the old oil, enough new oil to fill it up, a new oil filter and an oil filter wrench to remove the old one. First find a suitable place to park the FJ. Then, put the parking brake on. Next, look the oil drain plug located under the engine. You will need to have adequate access to this plug, so you might consider lifting your FJ up in the air using a jack and jack stands. Remove this oil drain plug using a socket wrench making sure your old oil collection device is located below this plug. Then, wait until all the oil comes out. 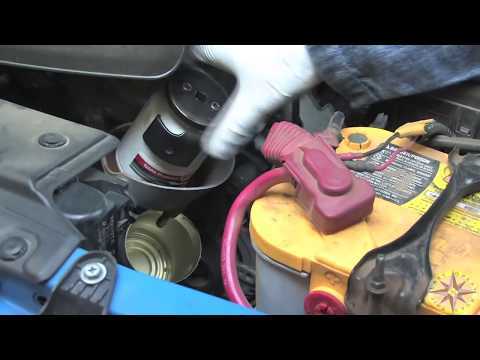 Next, locate your oil filter and using an oil filter wrench, you remove and replace it. Then, replace the oil drain plug making sure to hand start it and not cross thread the bolt. Next, pour in the new engine oil through the opening on top of the engine. After the right amount of oil has been added. Start your FJ Cruiser and let it run for a few minutes. Turn off your FJ and check your oil dipstick to make sure you have the right amount of oil in the engine. Also, inspect the floor below the engine for leaks. Changing your engine oil is a pretty straightforward process yet it is vital to making sure your vehicle is operating at its peak performance.